At “Empress Garden” you get to meet the energy of gestation. It has been a long trip though the Tree of Life tarot and now we come to the first of the three active energy cards: Empress, Magician, Fool. It is in this place that the changes you have worked on so hard finally come to break into your reality, However keep in mind that your journey will not be complete until you reach “Blind Mans Bluff” (Fool tarot card location). Empress Garden is located between Binah and Chokmah. 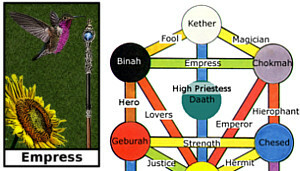 Binah supplies the motherly energy and Chokmah supplies the energy of spirit. The energy of spirit in this place is much more refined than in Priestess Heights. There you had to combine raw spiritual energy with intent and knowledge to get it to do something. In Empress Garden, this energy has already been refined for use by Chokmah and your own self though the previous paths. This unique energy makeup is what gives this place an almost conscious spiritual awareness or intelligence. When you are in Empress Garden, your seed reality that you have been creating all along is now ready for birth. The energy in this place is like the birth canal. It pushes and breathes life into your new creation. If you have been doing all the cards before here, then this place germinates the process of creating the new spiritual self that you began just 20 locations earlier. The energy here will activate the seed you have created and it will begin to grow. If you are here to see a cherished reality you have been working on to create, then this place will activate it as well. The quest here is to activate your new self (or reality) of what you have been developing. There are some items here to help you. You will see the familiar “Pyramid of Tomorrow” here, that holds your vision of the future. At the start this will be full with your vision inside. Upon successful completion of the quest here, your “Pyramid of Tomorrow” will be empty, as the blueprint of your vision is removed and sent to the gestation process. The sunflower produces sweet nectar that you can gently take and eat, to give you energy and life. Grab a seed from the sunflower and plant this seed into the fertile earth you find here. Think about what you are birthing when you do this. This action will begin the germination process and your physical world will now start to change to reflect the new person you have become or create whatever it is you came here to do in the Tree of Life Tarot. Once your seed is activated, you can look through the viewer, which is here, to catch a glimpse of how your new reality will take form. Just look into it, and it will show you what all your hard work was for and what it will create. Your creation or new self is now in motion, so it is too late to change the form of what will spring up. But you can manipulate and change what happens along the path. In “The Stage” location (Magician tarot card), you will learn how to do that. Here you just begin and experience the new birth you have brought to life. Demeter and Isis are two of the spirit guides you may meet here. Any of the mothering archetypes frequent this place. They represent the energy of gestation and the energy behind what propels your reality into form. The guide you meet here can help you with the beginning steps, so you have a smooth transition from your old state of being and into the new one. What usually makes transition so hard is letting go of the old way of life, so the new way can take form. The motherly guides here can help you let go of the old, so that the new can step up quickly and take the reins. Seed of Gestation: to help birth your new self or reality into form. Get this from the sunflower. Energy of Gestation: to give you energy and strength for a smooth transition to a your new reality. Get this from eating the nectar from the Sunflower. 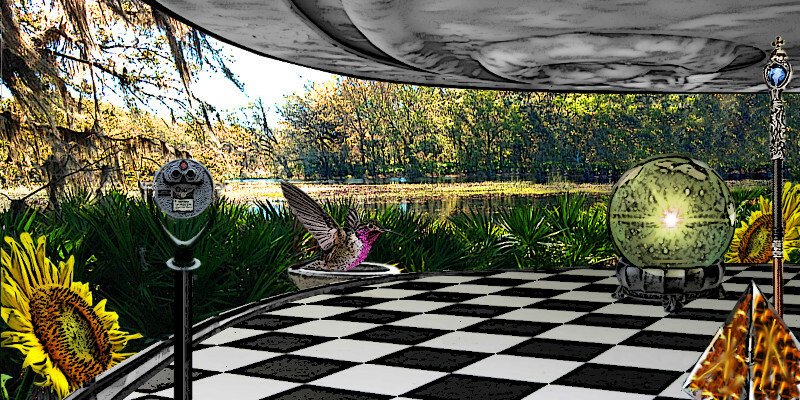 Gestation Viewer: peer into it to see what your new reality will look like. Pyramid of Tomorrow: this gadget is from some of your previous tarot locations and will be empty if you planted your seed, because your vision was removed and loaded into form. To get a glimpse of what the final product of your future will be, look into the Gestation Viewer. Oracle of the future (green sphere from the Tomb): See the long term effets of your new future you have created. Unlike the Gestation Viewer which shows you how your reality will take form. This gadget shows you the long-term impact your new future will have on the world and people around you. 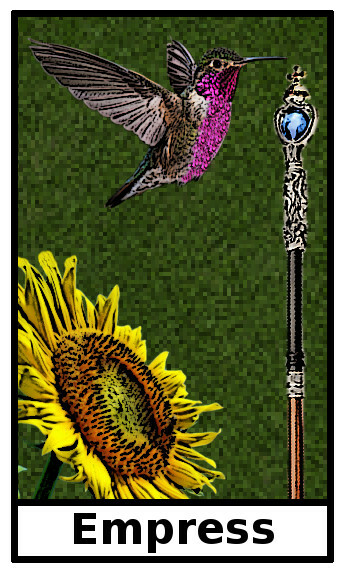 Empress Staff: helps to quicken the growth of your reality/garden. Take me to Empress Starship.